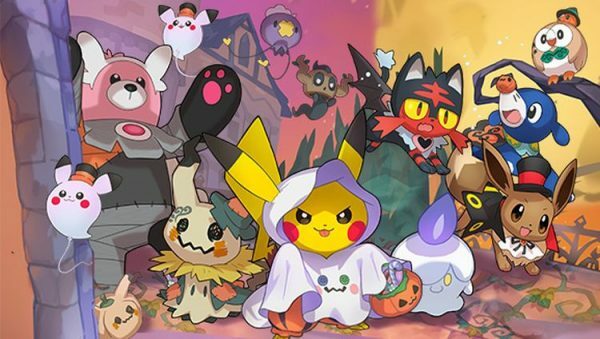 Attention Pokemon Go and Pokemon Sun and Moon players: some spooktacular fun is headed your way. The Pokemon Company has announced something special is heading to Pokemon Go. According to the announcement, coming later this month in Pokemon Go, something fun will be “scared up” while players are out searching for “new Pokemon” to put in their Pokedex. Could this be Gen-3 Pokemon? Only Niantic knows for sure, but it could just be an opportunity to catch more ghost-types like last year. The 2016 Pokemon Go Halloween event started October 26 and ran through November 1, and along with more Ghost-types, provided double the amount of candy for participating in activities. We expect the same this year, and maybe something new added for good measure. More information on the what’s in store for the Pokemon Go Halloween event is expected soon. And don’t forget Mythical Pokemon Marshadow is coming to Pokemon Sun and Moon starting next week on October 9. The creature comes with the Marshadium Z Crystal, and can use its Spectral Thief attack to steal another Pokemon’s stat boost while also dealing damage. GameStop stores in the US will be handing out codes October 9-23 for Marshadow, which is the only Fighting and Ghost-type Pokemon. Over in Europe, the Marshadow distribution for Pokemon Sun and Moon started on October 1 in various countries. Those in Germany and Italy can grab a code at GameStop, GAME (Nintendo Zone) in Spain, along with Intertoys and GameMania in The Netherlands (thanks, Serebii). In Belgium, codes are available at GameMaina, Intertoys, Smartoys and FNAC (Nintendo Zone). Codes will be handed out through November 16. In the UK, GAME has started slowly handing out codes at various locations, but not all seem to have cards available. Be sure to check with your local store to see if they have stock yet before making the trip.